Double CAN Bus J1939 engine NMEA2000 output converter. Read the main parameters from two ECU engines and convert them into NMEA2000 output to connect last generation plotters and/or integrated navigation systems. Converter developed for fuel level sensors with 10-180Ω calibration and NMEA2000 output in 57x55x28mm case. Available with level sensor cable of lenght L=1m. The converter consists of 3-phase synchro signals in the NMEA Standard HDT. The inputs with the jumpers can be adjusted to the present signal voltages. The ratio must be 1:1. RS-104 Interface Convertor is designed for direct and back transformation of RS-232 signals into RS-422 signals. It is used to coordinate different devices dealing with RS232/422 signals aboard of river and sea vessels. The data convertor is designed to couple two devices that cannot connect because of mismatch of their interfaces, characteristics and parameters, data types and formats, data passing frequencies etc. A marine converter is a device which transforms electrical current aboard a vessel. Such devices allow the use of 110/220-volt alternating current equipment even when the on-board system is limited to direct current from batteries. It also can be used to charge the batteries from shore power. There are several different types of converter. 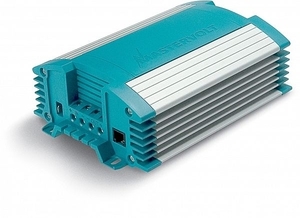 - A power inverter transforms direct to alternating current (DC/AC). - A rectifier transforms alternating to direct current (AC/DC). - A voltage converter modifies the voltage of a direct current (DC/DC:12V to 24 V, for example). The device may have several inputs and outputs. These can take the form of cigarette lighter sockets, alligator clips, electrical terminals or outlets. The converter must be protected against interference, overload and overheating. It also must be sealed in a sturdy, watertight housing to withstand the rigors of the maritime environment. Some are combined with a battery charger, a charge controller or another device. Choice will depend on the type of electrical transformations to be carried out and on additional desired features. Compute the maximum amperage to be handled as a function of the batteries and the devices to be powered. If you have a computer or screens on board, be sure the converter is protected against overload and interference.